Comtrol’s RocketPort products, such as the RocketPort multiport serial card, make high-performance device connectivity reliable, cost-effective, and easy. We offer a wide variety of port densities, interfaces, surge protection, and rack mount options to fit an array networking needs. 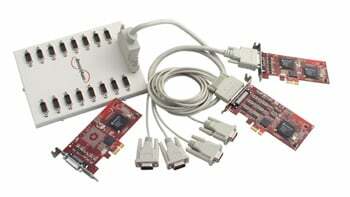 RocketPort EXPRESS is Comtrol’s next generation multi-port serial adapters, upgraded from previous PCI BUS technology. Available in 4-port, 8-port, 16-port, and 32-port densities, with quadcable and octacable fanout cables, these advanced PCIe cards can now be connected via PCIe BUS with increased speed. The EXPRESS design takes advantage of the increased performance of Comtrol’s exclusive Unity ASIC chip. Every RocketPort serial card features the high-performance RocketPort processor chip, consisting of a dedicated 44MHz core that minimizes host CPU utilization and optimizes data transmission via larger transmit and- receive buffers than those of 16550 UART chips, commonly used in standard PC serial ports and low-end serial cards.